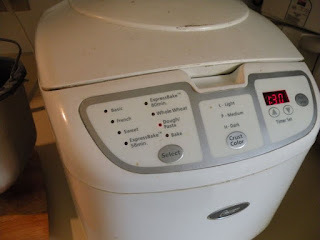 When Hubby and I were first married, I had a bread machine, but I couldn’t keep up with our bread needs since I was a full time student and later had a full time job. Add in California commute times and it just wasn’t feasible. So we mostly bought our bread. We favored a particular brand of Country Buttermilk bread. At over $4 a loaf, it wasn’t cheap, but there were only two of us and it was convenient. Fast forward several years and the number of mouths to feed has doubled. Not to mention my kids LOVE their carbs! Buying that bread is no longer an option. And since I stay home AND have the help of my trusty bread machine, I have no excuses either! Add all ingredients to the bread machine bowl. Set it for “Dough” and press start. My machine is getting old and I have to check about 10 minutes into the cycle to make sure the ingredients in the corners of the bowl are being combined. I usually slip a wooden spoon in there to help dislodge any pockets of flour that aren’t being mixed. After that it doesn’t need any more tending till it beeps. When the Dough Cycle is finished, remove the dough and divide it into two equal portions. Shape it into loaves and place each loaf in a greased 9x5 loaf pan. Preheat the oven to 350°F. Let them rise for 30-45 minutes (longer when the house is cool in winter, shorter when it’s warm in summer). I cover my pans with a damp tea towel while they’re rising. Bake for 30 minutes. Remove from pan to a wire rack to cool. The loaves are easier to slice when fully cool, but it’s awfully hard to resist a nice warm slice of fresh bread drizzled with honey or slathered with strawberry jam! Mmmm! 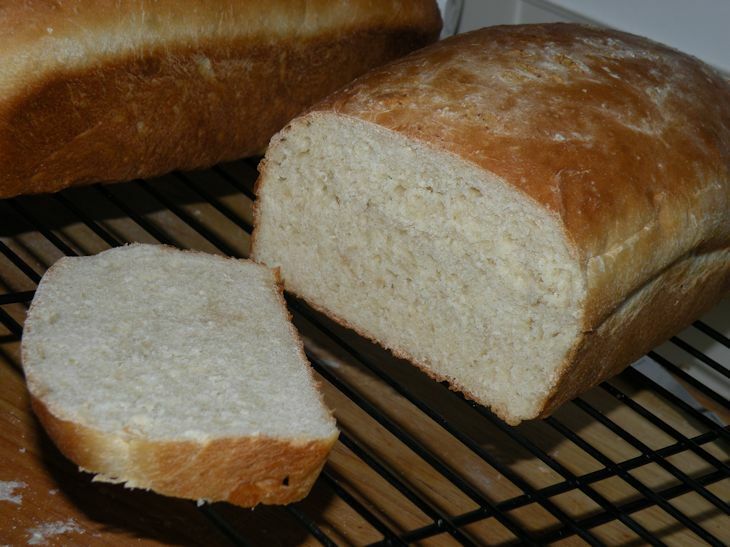 This same recipe can be used with a more traditional, hands-on bread making method. 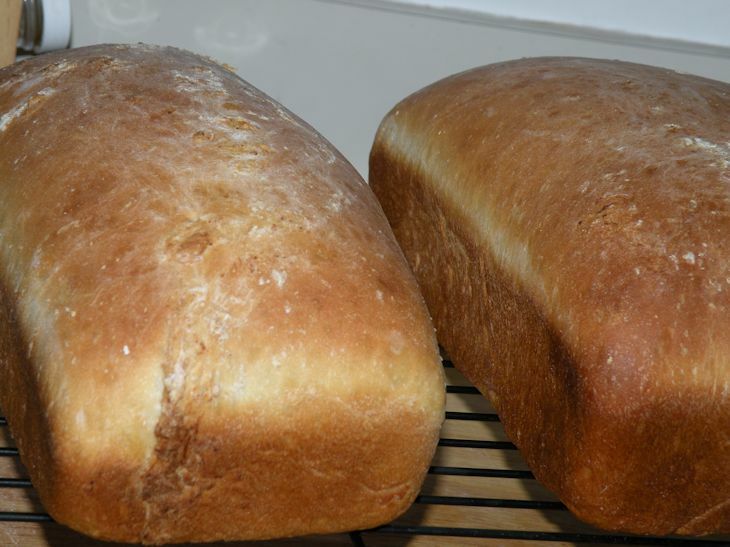 I make this recipe once a week and the two loaves usually last us the whole week. Once they're fully cooled, I usually wrap one loaf in plastic wrap and then in aluminum foil and toss it in the freezer. Especially in the hot summer months, this keeps it fresh until the first loaf is used up. Sometimes I'll bake some extra loaves to have on hand. They make great gifts! * You can substitute milk with some vinegar for the buttermilk. Just fill your measuring cup almost full and then top off with vinegar. Let it sit 10 minutes till it’s gotten thicker. It doesn’t taste as good in my opinion, but it does work in a pinch! Hubby can always tell when I haven’t used real buttermilk. **You could use bread flour instead of all-purpose flour and wheat gluten. I do it this way ‘cause it’s cheaper for me. The wheat gluten makes the texture truly fantastic! Sounds wonderful! I am pinning this! Great! Let me know if you try it and how you like it! I am pinning this as well! Have you tried it with whole wheat flour? I have done it once with whole wheat white that my mom milled for me. It was fabulous! I don't usually use whole wheat though. Some day I'd love to get a flour mill and do the whole wheat white all the time! If you try it with whole wheat flour, let me know how it turns out! I've never tried buttermilk bread, so I'm excited to see how it turns out. Pinned!